Many people who are in the fortunate position of being able to build custom homes often opt for a spacious laundry room. This room may not only be the place to do laundry but also to do crafts or sewing as well. Here are some of the most common must-haves for a custom laundry room. Good lighting, both natural and artificial, keeps a laundry room from taking on the glum and gloomy look that many folks imagine belonged to Victorian-era sculleries. Ample light also makes it easy to read instructions on clothing care labels and boxes and bottles of cleaning products. All a laundry room really needs is a couple of long shelves above the washer and dryer, but adjustable wire shelving can be hung to hold laundry detergent, bleach, spray bottles, canisters of clothespins, rolls of paper towels and other needful things. A collapsible rack against another wall is useful for air drying delicate articles of clothing. The person who’s doing the laundry for the week shouldn’t have to scrabble around for the bleach or stain remover. These items should be placed in bins that are clearly labeled and placed on the shelves. When the laundry is done, the cleaning products should be cleaned off with a paper towel and returned to their bins. Another good organizing tip is to hang a stain removal chart on the edge of the shelf next to the bin of stain removers. Laminate the chart so it doesn’t get wet. What people who only have a little niche for their laundry room often miss is a place to fold their clothes after it comes out of the dryer. A custom laundry room can have a table or even an island for this purpose. An island in the laundry room can have drawers and open shelves to hold other items that make laundry day less of a drudgery and more of a pleasure. All of this requires adequate room. It is a bit ghastly to find that there’s so little space for a washer and dryer in a laundry room that the dryer has to be turned sideways to fit, especially for people who have paid good money for their custom homes. A good laundry room is a well-lit and well-ventilated room with space for washing, drying, folding, hanging and ironing. 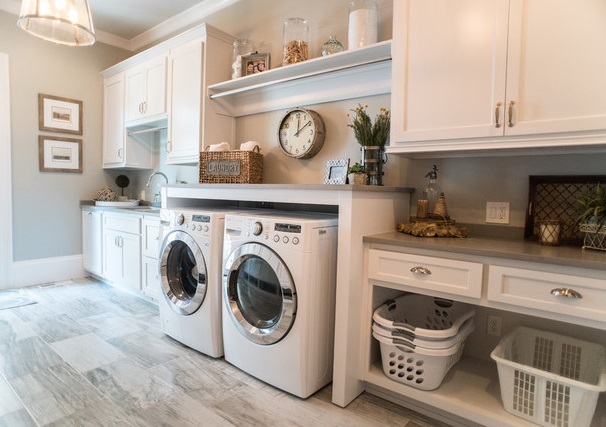 Let BagCon Signature Homes, Inc. help you design your beautiful new home with the laundry room of your dreams.